If you develop a family of apps, all of which rely on the same user secret, you can use access groups to securely share that secret among those apps. For example, you can share credentials, so that logging into one of your apps automatically grants the user access to all of your apps. This kind of sharing doesn’t require interaction with or permission from the user, but limits sharing to apps that are delivered by a single development team. An access group is a logical collection of apps tagged with a particular group name string. Any app in a given group can share keychain items with all the other apps in the same group. You can add an app to any number of groups, but the app is always part of at least one group that contains only itself. That is, an app can always store and retrieve private keychain items, regardless of whether it also participates in any other groups. Keychain items, on the other hand, are always part of exactly one group. This form of keychain item sharing is available to all iOS apps, but to macOS apps only when they use the iCloud keychain by setting an item’s kSecAttrSynchronizable attribute to true. For macOS apps not using the iCloud keychain, share items with access control lists instead. See Access Control Lists. The optional Keychain Access Groups Entitlement holds an array of strings, each of which names an access group. Xcode automatically adds the application-identifier entitlement to every app during code signing, formed as the team identifier (team ID) plus the bundle identifier (bundle ID). When you collect related apps into an application group using the App Groups Entitlement, they share access to a group container, and gain the ability to message each other in certain ways. Starting in iOS 8, the array of strings given by this entitlement also extends the list of keychain access groups. Xcode handles the application identifier (app ID) for you when you set the bundle ID. You set the others by manipulating capabilities in Xcode. As a result, by default, each app’s keychain items remains isolated from all other apps. In effect, the two apps gain a region of overlap to share items. Notice that the distinct areas represented by the app IDs are still present, allowing each app to continue to access its own, private items. But both apps now also belong to the shared items group, enabling them to share keychain items. In this way, you can add an app to as many different groups as you like. When your app belongs to an app group, it can share certain kinds of non-keychain data with other apps in the same group. For example, you can use the init(suiteName:) method to create a new UserDefaults instance that shares the preferences you set among all the apps in the app group. Like keychain access groups, you enable app groups with a capability in Xcode. This allows it to share keychain items with any app in the App Suite group (distinct from any sharing it’s already doing with apps in the shared items keychain access group). 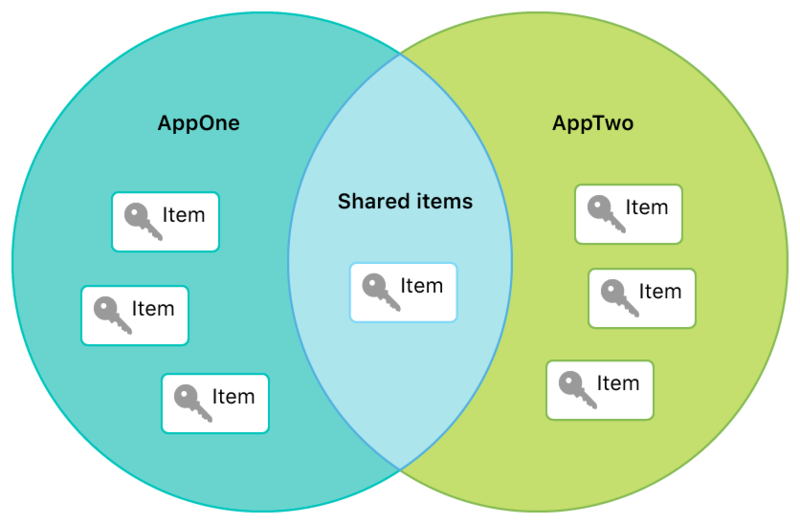 App groups and keychain access groups aren’t mutually exclusive—you can use both in the same app—but they do differ in several important ways that may help you decide which to use for a given situation. 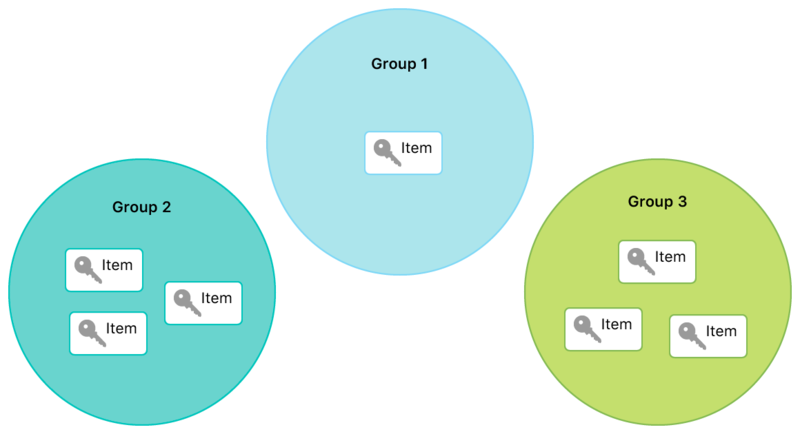 First, as described above, using an app group enables additional data sharing beyond keychain items. You might want this extra sharing, or might already be using an app group for this purpose, and thus not need to add keychain access groups. On the other hand, you might not want to enable this additional sharing at all, and prefer keychain access groups instead. Second, order matters. The system considers the first item in the list of access groups to be the app’s default access group. This is the access group that keychain services assumes if you don’t otherwise specify one when adding keychain items. An app group can’t ever be the default, because the app ID is always present and appears earlier in the list. However, a keychain access group can be the default, because it appears before the app ID. In particular, the first keychain access group, if any, that you specify in the corresponding capability becomes the app’s default access group. If you don’t specify any keychain access groups, then the app ID is the default. Unlike apps, which can belong to many access groups, keychain items belong to a single group, identified by the kSecAttrAccessGroup attribute. From the item’s point of view, the world is a collection of disjoint groups, and the item belongs to exactly one of them. let accessGroup = "<# Your Team ID #>.com.example.SharedItems"
Use any of the groups to which your app belongs. If you try to use an access group that your app doesn’t belong to, the operation fails. This includes attempts to “prime” an entry using a zero-length string as the value for the kSecAttrAccessGroup key, because the empty string represents an invalid group. If you don’t specify any access group, keychain services applies your app’s default access group, which is the first group named in the concatenated list of groups described in Set Your App’s Access Groups. When you search for keychain items with the SecItemCopyMatching(_:_:) method, you can likewise specify an access group in the search query to limit your search to a particular access group. If you don’t, the search returns any items with a group that matches one of your app’s groups.